As a Federal District Court considers a claim that the Commission on Presidential Debates should eliminate requirements that plaintiffs say effectively excludes a third, unaffiliated candidate from participating in the presidential debates, a new survey of American voters finds overwhelming support for making it more possible for a third candidate to participate in the presidential debates. A similarly large majority favors efforts to make it more possible for independent and third party candidates to compete in Congressional elections. The survey was conducted by the Program for Public Consultation (PPC) at the University of Maryland, with a sample of 2,569 registered voters and released today by the nonpartisan organization Voice of the People. Currently the Commission on Presidential Debates, which controls the debates, requires that candidates receive an average of 15% support in five major national polls just prior to the debate. No independent candidate has met this requirement since the Commission was established in 1987, though an exception was made for Ross Perot in 1992. A very large majority of 72% said it is very (45%) or somewhat (27%) important to “make it more possible for an independent or third-party candidate to participate in the presidential debates” (Republicans 69%, Democrats 72%, Independents 78%). Even larger majorities support a standard for inclusion in the presidential debates that is more likely to be met than the Commission on Debate’s current requirement. The proposed requirement is that “a candidate must fulfill the state requirements to be on the ballot (primarily getting signatures) in enough states that the candidate could conceivably win an election.” The proposal was supported by 77%, including 75% of Republicans, 77% of Democrats and 83% of independents. Support was equally strong in very red districts as very blue districts. “The public is sending a loud and clear signal that they would like to hear from more than two main party candidates when making the critical decision about who should be president,” commented Steven Kull, director of PPC. To ensure that respondents had fully considered both sides of the issue, before asking them for their final conclusion, they were asked to evaluate an argument for and an argument against the proposal. The argument in favor stressed that the current independent and third party candidates “bring important new perspectives,” that the current requirement to achieve 15% support in the polls is “a catch-22, because the candidate would need name recognition to get support,” that the main party candidates have the advantages of the financial and institutional support of the parties, and that “getting the many thousands of signatures needed to get on the ballot in many states is enough of a requirement.” This argument was found convincing by 81% (Republicans 80%, Democrats 81%, Independents 82%). The counter argument stressed that the debates are a key moment for voters to see and hear “the candidates who have a realistic chance of winning the election,” that having up on the stage “another candidate who is not really a serious contender is a big distraction, driven by an excess of inclusiveness,” that the 15% polling requirement “works to make sure only viable candidates participate,” that no one is prevented from meeting this standard, and that “just getting a lot of signatures, which can be done if you hire enough canvassers, is too low a bar.” This argument was found convincing by a much smaller 41% (Republicans 45%, Democrats 40%, Independents 34%). Respondents also evaluated the proposal that “the government should take steps to make it more possible for independent and third-party candidates to compete in Congressional elections.” A similarly large 74% favored the proposal, including 71% of Republicans, 75% of Democrats and 78% of independents. Support was equally strong in very red districts and very blue districts. 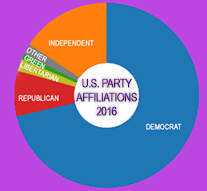 The argument in favor emphasized that with more independent and third party members of Congress that the two big parties would be less powerful, that they would be less able to drive Congress into gridlock, that they would have to be more flexible so as to form coalition with nonaligned members, that nonaligned members might be able to break through impasses and that “voters who are not enthusiastic about either of the big parties, would finally have a real voice in Congress.” This argument was found convincing by 82%, with little differences in party affiliation. The argument against stressed that there is no need to make efforts to help out independent and third-party candidates, that there are already independent members of Congress, and other parties, that “nothing forces someone to pick one of the two major parties,” that third parties should build themselves up by grassroots organizing and fielding good candidates rather than “tweaking the rules in their favor,” that having independent or third-party members will not necessarily lead to consensus because some might be more extreme than the big party candidates, and that “with more players in the field, it might be even harder to find common ground.” Only 41% found this argument convincing, with little difference among the partisan affiliations. The survey was conducted online from Sept. 22 – Oct. 17, 2017 with a national probability-based sample of 2,569 registered voters, provided by Nielsen Scarborough from Nielsen Scarborough’s sample of respondents, who were recruited by mail and telephone using a random sample of households. The national sample has a margin of error of +/- 1.9%.